The Human Touch Perfect Chair is the definition of comfort! The PC500 is "the perfect chair": it allows the user to recline completely into a "zero gravity" position. This allows your feet to be level height with your shoulders thus taking the pressure off of your spine and allowing you "to decompress"! This chair is amazing. The PC500 provides the ultimate in comfort, class and grace. It is ideally suited for a person of a slightly smaller stature. The Perfect Chair Silhouette is powered by Power Immersion Motion which seamlessly reclines the chair into the zero gravity position. The features in this visually simplistic chair include: easy controls, lumbar support, quality leather design and more. If you are looking to add a strong sense of style and taste to your decor this is the chair for you! No longer do you have to choose between ultimate comfort and elegant style! The Human Touch PC 500 Silhouette Power is the simple, natural design in the Human Touch series. 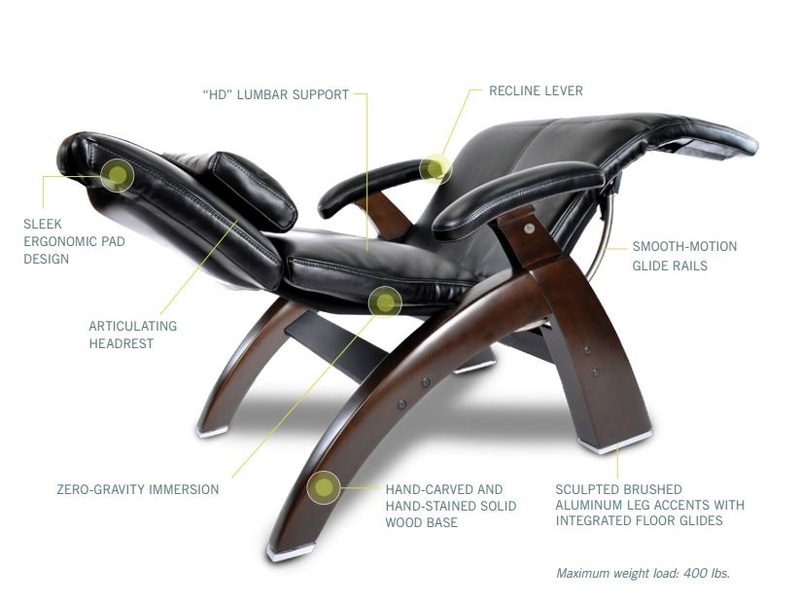 This chair utilizes the body's own weight to effortslessly recline into the "zero gravity position". Its features include: simplistic design, top-quality materials, and the ability to add accessories to make those taller than average users feel "right at home" with this model. Please don't hesitate to inquire about our free delivery options available for the Human Touch PC 500. We ship Free Nationwide daily and maintain an A+ Rating with the Better Business Bureau. Experience relaxing postural support to the lower lumbar region with the high-density, or “HD” support that has been built in to the pad set. Expertly crafted using only premium upholsteries, this sleek new pad is designed for ergonomic comfort and support. SōfHyde, top-grain leather or premium leather upholstery covers the pad from head to toe, including the arms. The recline motion smoothly eases back the Perfect Chair to position your body in a state of virtual weightlessness. The zero-gravity ergonomics of the Perfect Chair are a unique balance of support and seating comfort. The neutral posture position raises the legs above the heart, relieving weight from the spine. In this position, the body relaxes into a virtually weightless posture, which physicians recommend as the healthiest way to sit. Maximum ergonomic posture is ensured at all recline angles through the fixed-form seating position. Find relief from stress as you defy gravity in the Perfect Chair. Bookend Your Day The Perfect Chair is an integral part of your day. Use it upon waking as a comfortable place to sit and read the morning paper. Take a break after your morning workout to recover. Rejuvenate with an afternoon nap. Relax after a long day at work and enjoy a home theater experience. Prepare for a soothing sleep. Start and end your day in perfect comfort and relaxation with the Perfect Chair. We have found that a simple 10-15 minute session at the beginning and end of each day allows you to feel the wellness benefits constantly and keeps your body as comfortable as possible. Not all seats are created equal. SōfHyde - is a luxurious and durable upholstery expertly formulated to replicate the comfort, style and feel of real leather. SōfHyde is designed to last for many years of use and is comfortable, soft to the touch and stain-resistant. Top-Grain Leather - Surrounding yourself in fine leather is the ultimate luxury. Our top-grain, aniline-dyed leather is made from the strongest and most supple part of the hide. Perfect Chairs are made in a variety of different leather colors, finishes and matches, including some rare and hard-to-find vegetable-tanned and glass-polished limited edition selections. 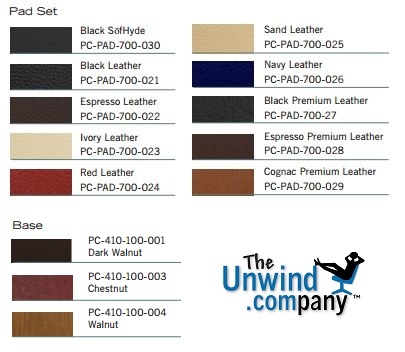 No matter which one you choose, the leather’s texture is soft to the touch and its hues are rich and inviting. When seated in the chair, you will feel cradled in comfort. Premium Leather - Only five percent of the world’s natural, uncorrected cowhides are sufficiently free of imperfections to qualify for use as Human Touch Premium Leather. Top-grain, aniline-dyed hides from the United States and Brazil are carefully measured, cut and sewn all under one roof. This is what makes the supple leather luxurious, resilient and so soft to the touch. Reclined Dimensions: Length: 60" Width: 29" Height: 26" Seat Width: 22"
Upright Dimensions: Length: 42" Width: 29" Height: 46" Seat Width: 22"
This recliner feels awesome on my lower back. I can't wait to kick back and watch the game this weekend. PC 300 Zero Gravity Recliner from Human Touch. Bargain Priced!